Icebergs in New Zealand? – The Great KiwiCombo Pass. See New Zealand your way! 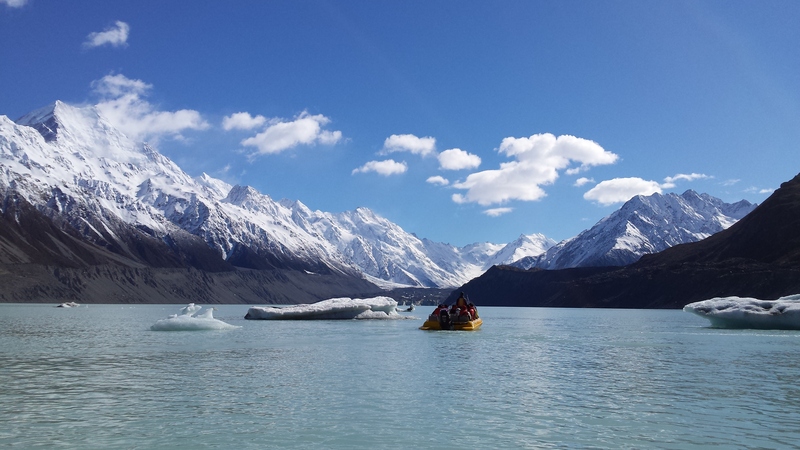 This outstanding scenic boat trip is possibly one that is not immediately associated with New Zealand, but if you’re travelling in the vicinity of the Aoraki/Mount Cook National Park during your New Zealand vacation, it’s a trip not to be missed. 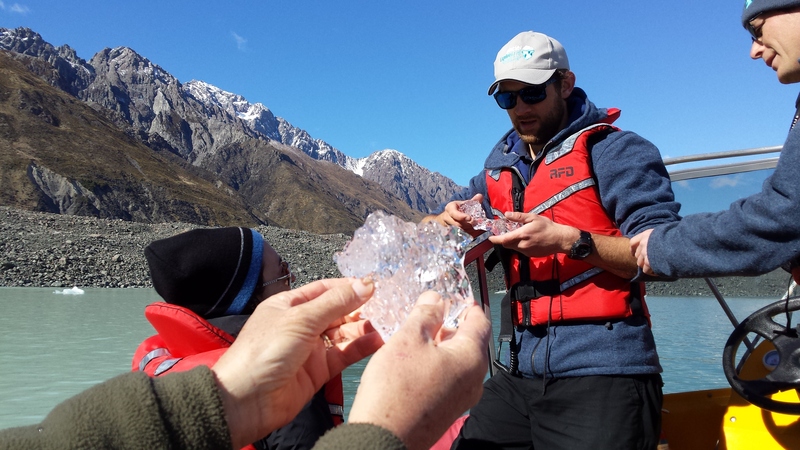 With the Tasman Glacier receding over the last few years, a 5km long glacial lake has formed at the terminal face. At fairly regular intervals, large chunks of ice carve off the terminal face and float as icebergs down the entire length of the lake. From a distance the icebergs look quite small against the backdrop of the Southern Alps, but once up close to them and realising that 90% of their bulk is under water, their true dimensions become quite astonishing. The scenic boat trip to view the icebergs begins at The Hermitage Hotel with a short bus transfer to the carpark nearby the glacial lake. From there it is a 20 minute flat walk along a gravel pathway to the floating pontoon where the cruise boat is moored. With everyone aboard, the boat gently cruises around the icebergs and, being small and agile, is able to get within touching of the ice. Care is taken not to nudge the icebergs as they can roll over unexpectedly. Newly carved icebergs are the most turquoise blue, but they turn brilliant white within a few hours. Depending on wind conditions, a newly carved iceberg can float the length of the lake in a single day. After ample time to visit several icebergs, the boat speeds up the lake to the terminal face. Here the sheer gravelly ice wall of the Tasman Glacier is stunningly majestic. It looms high above the boat, quite intimidating, but because of the risk of an unexpected ice carving off the terminal face, the boat keeps a respectful distance. Photo opportunities abound during this trip. The majestic snow-capped Southern Alps provide the most dramatic backdrop. 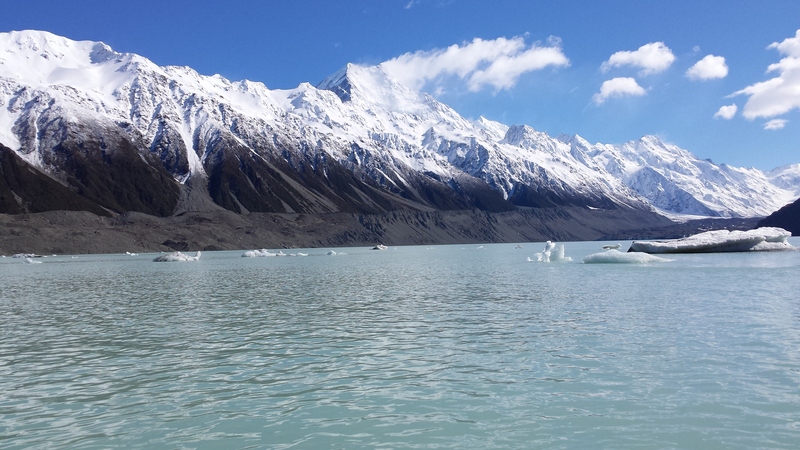 As well there are outstanding views down the Tasman Valley towards stunning Lake Pukaki. Each scenic boat takes 10 people and there are a maximum of 4 boats on the lake at any one time. Wear comfortable walking shoes, sunglasses are an absolute must and, depending on the weather, wear warm layers of wind and rainproof clothing. A cosy beanie hat is also recommended. At the pontoon, before boarding the boat, a secure bin is available to stow personal belongings not required for the trip i.e. day packs etc. Allow 3 hours and be aware that the trip doesn’t operate during the winter when the lake is frozen! During the summer reservations are essential as space is limited. This is an outstanding trip, on the gentle side of “adventure”, with plenty of opportunities to get the most amazing photos. The remote alpine scenery is out of this world. It’s definitely worth including in your New Zealand trip.